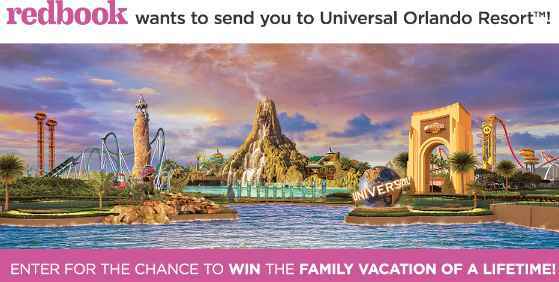 Enter the Redbook Universal Orlando Resort Summer Sweepstakes now through August 06, 2018 for your chance to win family vacation of a lifetime Universal Orlando Resort in Orlando, Florida. Trip Includes: Round trip airfare, Tickets to Blue Man Group, Hotel Accommodation and more. Prizes: One grand prize winner will win a four (4) day, three (3) night trip for for four (4) people to Universal Orlando Resort in Orlando, Florida (“Trip”). Trip will include: (i) round trip economy class air transportation for Winner and up to three (3) Guests from a major commercial airport near Winner’s home to Orlando, FL; (ii) three (3) nights standard hotel accommodations(one room, quadruple occupancy, room and tax only) at Universal’s Aventura Hotel or at another on-site hotel; (iii) non-exclusive ground transportation to and from airport and hotel in Orlando, FL; (iv) 3-Park 3-Day Park-to-Park theme park tickets for admission to Universal Studios Florida and Universal’s Islands of Adventure theme parks and Universal’s Volcano Bay water theme park for Winner and up to three (3) Guests;(v) 1-Day 2 Park VIP Experience guided tour(non-private)through Universal Studios Florida and Universal’s Islands of Adventure for Winner and up to three (3) Guests;(vi) and admission to one (1) Blue Man Group Show for Winne rand up to three (3) Guests. When To Enter: The Sweepstakes entry begins at June 19, 2018, at 12:01 AM (ET), through August 6, 2018, at 11:59 PM (ET). Who’s Sponsor: The Redbook Universal Orlando Resort Summer Sweepstakes is sponsored by Hearst Communications, Inc.